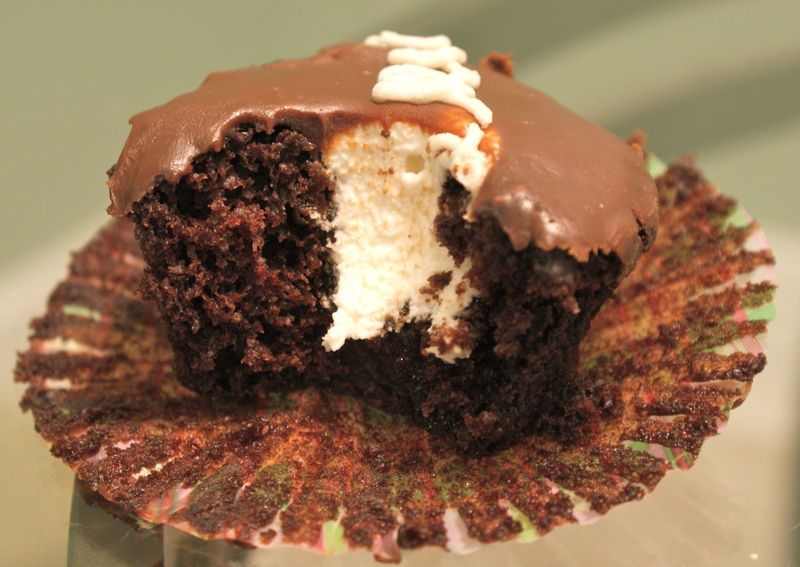 I’ve been looking around for inventive cupcake ideas when I came across this miraculous recipe. Faux Hostess Cupcakes. All I have to say after making these is, Thank you, Google. Thank you, thank you, thank you! First of all, the chocolate cupcakes for this recipe will now officially be my “go-to” chocolate cupcake. It’s light and moist and not overly chocolatey. Moving on to the cream filling. Oh the cream filling. Also another recipe I’ll be reusing. It could easily be used as frosting for a S’mores cupcake, which is an exciting prospect. Sweet and creamy, what more do you need? Lastly, chocolate ganache needs no explanation. I mean it’s chocolate. All of these components combined made for a cupcake that was heaven-sent. The entire batch has been gobbled up over the past few days, and that was with us even trying to pace ourselves! One little warning in assembling these little cakes: do not pipe in the filling from the top. The blogs I read said “don’t worry the ganache will cover the filling.” Well, it didn’t. I’d recommend either piping it in from the bottom or cutting out a little crater in your cupcake and recovering. Also, I realize my piping swirls aren’t perfect. I’ve never really done much detail piping. For a first time, it’s acceptable though. Take my word, you MUST try these cupcakes. It will change your world. Preheat oven to 350 degrees F. In a large bowl sift together sugar, Dutch process cocoa, baking powder, baking soda and salt. In a separate bowl, beat together eggs, oil, buttermilk and vanilla and then add into the dry ingredients. Whisk in the hot coffee. Using a mixer, cream the butter until light and fluffy. Beat in 1/2 cup confectioners’ sugar. Add the vanilla and 1 tablespoon heavy cream; beat until smooth. Beat in the remaining 1/2 cup confectioners’ sugar and 2 tablespoons heavy cream in batches, alternating after each addition. Beat in the marshmallow creme; set aside or refrigerate. Inject each cooled cupcake with 1-2 tablespoons of the filling with a piping bag. Heat the cream in a saucepan over medium heat stirring frequently until the cream is hot and just starts to boil. Immediately pour the cream over the chocolate and whisk until smooth. 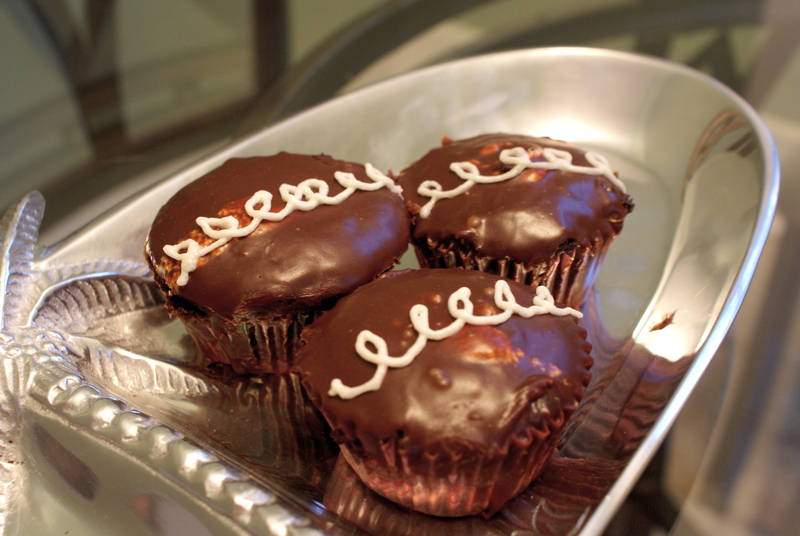 Spread warm but slightly cooled ganache over the tops of the filled cupcakes. Level off ganche with knife or spatula and let cool for 15 minutes. These were delicious. I went looking for one last night and they were all gone. Perhaps you will have to make these again. thanks so much! they were pretty yummy!